Centaury offers many health benefits and in ancient times these benefits were already known to Romans who used it, among other things, as an antidote to snake poison. It is a bitter tonic that helps to reduce fever, has deworming properties and is very useful for the gastrointestinal tract that helps to expel excess gas, to relieve bloating, heartburn, dyspepsia, appetite, constipation, flatulence pains in the intestines and stomach, bloating from excess gas and colic. Centaury is also believed to cleanse toxins from the liver, kidneys, and gallbladder, as well as purify the bloodstream. Taken over time this herbal tincture has been used to mitigate anemia, for suppressed menstruation and it tends to help in taking off weight. This herb works well for treating depression and psychosomatic conditions. It has been used primarily in appetite loss and anorexia, when it is associated with liver weakness and for the weakness of the stomach after a prolonged illness. It has often been combined with Burdock Root and Chamomile for eating disorders. It has been found to be of great benefit muscular rheumatism. Centaury extract is also very useful for those people who lead sedentary lives and do not get much outdoor exercise and prolonged use of this herbal supplement is helpful in weight loss. Women used Centaury to encourage the onset of delayed menstruation and to relieve cramps. It is commonly combined with Barberry to relieve the pain of gout. This herb, because it has a soothing effect on the nervous system, works well for treating depression and psychosomatic conditions. Centaury, also called bitter herb, common centaury, European centaury, lesser centaury and feverwort, acts as a general tonic to strengthen both the liver and gallbladder, minimizing the risk and easing such diseases as gallbladder disease, liver disease, jaundice, and hepatitis. Centaury is a liver tonic herb that helps to increase liver metabolism of protein and fat, thereby inhibiting bad estrogen produced by women's bodies during menstrual cycles, resulting in less menstrual cramps caused by high levels of estrogen. It improves the digestive system in absorption of vital nutrients resulting in reducing the risk of nutrient deficiency which is often found in most women with endometriosis during menstrual cycle. Its blood purifying properties increase blood oxygen levels and reduce toxins lessening the risk of endometrial implants and adhesion attached to the organs other than endometrium. This herbal extract is recommended by German Commission E for people with poor appetite especially during a slow convalescence, heartburn or indigestion, and that bloated feeling in the stomach. Centaury has been used for strengthening the digestive system and may be highly helpful in many diseases associated with digestive debility, for instance, dyspepsia or peptic discomfort. It stimulates the bowels and stomach and assists in general weakness and an effective remedy for flatulence, gastric problems, nausea, colic, diarrhea, and constipation. Some believe that the herb can improve metabolic disorders and promote weight loss and fight obesity. 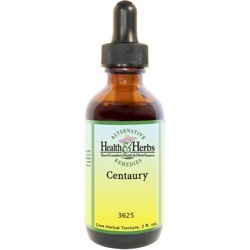 Centaury herbal tincture is considered a vermifuge and is effective in expelling worms from the intestines. This herbal remedy is said to be good for intermittent fevers and other feverish illnesses such as malaria with its quinine property. It is said to boost perspiration and purify the blood; and as such, the herb will help to cool the body, lower fevers and help expel toxins from the body through the skin. Centaury has also been used to strengthen the kidneys, which allows older patients and children with incontinence or bedwetting problems to regain control of their bladders. This flower extract can be used externally to destroy lice and dandruff. Centaury has also been used to bring back the natural color of hair and for treating skin blemishes and removing age spots and freckles on the skin. As an antiseptic Centaury herb has applications for treating minor wounds, animal bites, insect bites and sores. Ingredients: Centaury Leaf, Structured Water, 20% Alcohol. Non-Alcohol: Centaury Leaf, Structured Water, and Vegetable Glycerin. Instructions: The plant needs to be taken over a number of weeks and an infusion should be slowly sipped so that the components can stimulate reflex activity throughout the upper digestive tract. Contraindications: Pregnant women should not use Centaury Herbal Supplement. Overuse (many times the recommended dosage) will produce vomiting. From Anonymous of Lithia Springs, Georgia on 10/13/2014 . From Anonymous of Dublin, Ireland on 2/27/2014 .